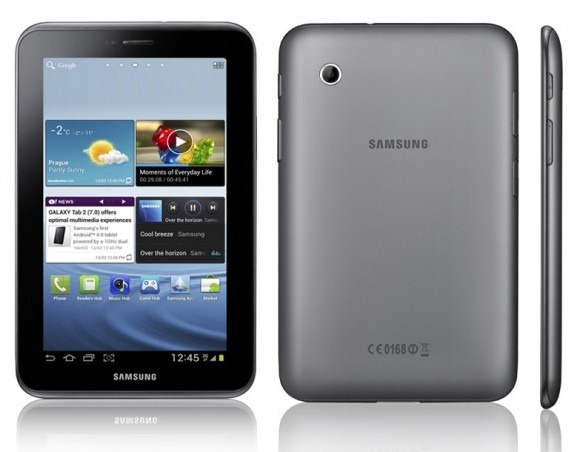 Samsung’s UK arm is offering a free Galaxy Tab 2 7.0 to anyone who trades in one of a selection of smartphones, and upgrades to a Galaxy S III or Galaxy Note in the process. Free tablets? You betcha! Everyone loves free stuff. Free chocolate’s cool. Free beer is great. Free tech, though, is about as good as it gets in our eyes. That’s why this particular story grabbed our beady eye earlier, and we thought those of you in the UK with a hankering for a new Galaxy phone really ought to know what’s on offer from those lovely guys at Samsung. As the story goes, Samsung UK is offering up a free Galaxy Tab 2 7.0 for anyone who upgrades from selected handsets and chooses to buy either a Galaxy Note or Galaxy S III. Interestingly, the recently announced Galaxy Note II is not included in the offer, perhaps showing Samsung’s desire to get the old stock shifted before replacing it with the new. Who can really blame them? So what do you need to trade in to get in on this deal? 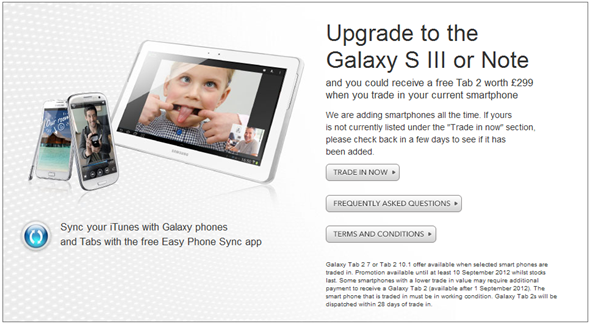 Apparently, Samsung wants your Galaxy S II, iPhone 4 or iPhone 4S in exchange for a shiny new Android tablet. Everyone else? Well, you’ll need to stump up some cash. The tablet in question, the Galaxy Tab 2 7.0 normally retails for around £299 in the UK ($475 in the US), so a free one is not to be sniffed at! Samsung says that this particular promotion will run until at least September 10th, so it may well carry on beyond that, presumably depending on demand and the number of Tabs Samsung has sat in a warehouse somewhere. Obviously the traded-in smartphone needs to be in working order, and your free tablet will be shipped within 28 days. A little wait, but you can’t really complain when you’re waiting for a free tablet! The Galaxy S III is already selling like hotcakes, so the promotion certainly seems aimed at moving as many Galaxy Notes as possible before the handset’s predecessor finds its way into the supply chain. A cunning ploy indeed, especially considering the Tab itself isn’t exactly flying off store shelves. You can get started by heading over to the official Samsung page. As mentioned before, this promotion is for UK residents only.